Each of these luxurious 510 sq. ft. rooms features elegant décor and modern amenities. You'll find marble flooring in the foyer, a comfortable sitting area, and an entertainment center. The technology includes a large LCD TV, an iHome alarm clock, and automatic curtains. These 510 ft² rooms are located in the Spa Tower, they feature stunning views of the city, sophisticated eucalyptus-crafted furnishings and lighting, air-conditioning and drape controls. These rooms offer an array of luxurious amenities, such as an Italian marble bathroom with soaking tub and glass-enclosed shower. Located in the Bellagio Tower’s North and South wings, with stunning fountain-views, each of these luxurious 510 sq. ft. rooms features elegant décor and modern amenities. You'll find marble flooring in the foyer, a comfortable sitting area, and an entertainment center. The technology includes a large LCD TV, an iHome alarm clock, and automatic curtains. Located at the end of the hallways, in the Spa or Bellagio Tower, these 853 sq. ft. rooms have plenty of luxurious details. Each one features a lounge area, an executive workspace, and automatic curtains. In the Italian marble and granite bathroom there is a whirlpool tub, a separate shower and brand-name bath amenities. These 1,020 sq. 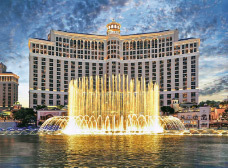 ft. suites are located in the Spa or Bellagio Tower. They come complete with an elegant living room, a work area, and a sumptuous master bedroom. You'll also find his and her bathrooms. Her bathroom has a whirlpool tub and a vanity with illuminated make-up mirror. His Bathroom has a shower with a bench and steam jets, along with brand-name bath amenities.